Getting started with JTAG tools has never been so convenient! The Test Fault Locator is the sub-system of the JTAG Manager, the StarTest software tool, which is the PC-based operational envelope and is intended for the JTAG test run on the electronic board manufacturing facilities (OEM) and/or in the R&D labs. 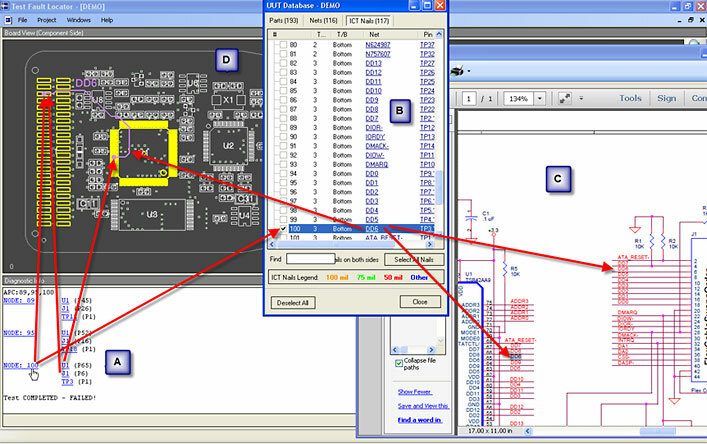 The Test Fault Locator is the graphical fault highlighting software package that gives the test operator access to a graphical view of the board-under-test (BUT) and integrates with any JTAG/ICT/FT testing system. The test reports can be linked to the BUT layout view by clicking on a pin or a net in the test report. The Test Fault Locator highlights and pinpoints the location of a pin and/or a net in the BUT layout view, thus giving access to all of the available information about that pin, as well as showing the exact routing of the net connected to that pin. The production facility test operator can locate the suspected pin on the actual board being tested easily, and quickly inspect it for obvious defects. The Test Fault Locator accepts input data (schematic, layout, and the the test result files) from a variety of sources. All relevant data contains in specifically designed Test Fault Locator Data Base that consists of the complete information and handling tools for the hardware (assembly) versions of each BUT. The Test Fault Locator have simple and friendly operator oriented GUI. With the Test Fault Locator usage many tasks such as finding specific nets, components and other items in the schematics or layouts become simple and straightforward, even for very complicated and tightly populated boards. The highly beneficial Test Fault Locator feature for a production facility test operator is the simple board repair based upon the test diagnostic reports. The Test Fault Locator is built as a unique and powerful graphical tool for highlighting the elements of the Diagnostic Info pane A (the faulty device reference name and the faulty node number from the test result file), as well as info of the ICT Nails List in pane B (the ICT nail name and the type of the ICT pad), and for pinpointing them on the BUT schematics (pane C) and on the BUT layout view (pane D), on the both sides of a BUT. 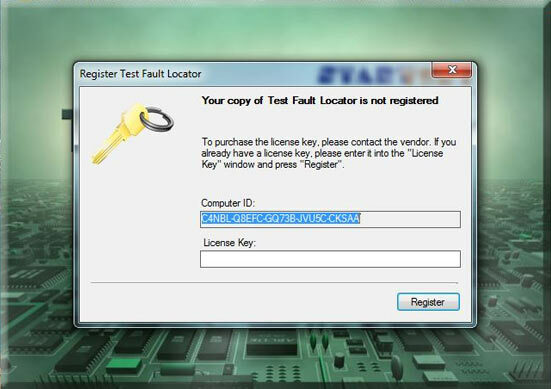 The Test Fault Locator can be purchased with node-locked license or get free version (excluding new project creation GUI) with purchasing the JTAG Manager. Download fully operated 30-days evaluation version now. The license for 30-days evaluation version will be sent to user after receiving the Computer Hardware ID, obtained by first start the software after it's installation on the user's computer. Copy data from Computer ID line and send to info@start-test.com with the subject TFL 30-days evaluation. The License Key will be sent to you shortly.